As they walk through the streets of Yaba in Lagos, Nigeria Wura-Natasha Ogunji and six women dressed in matching costumes and masks around their faces, carry kegs full of water that are strapped to their ankles. Catching the attention of those they pass on the street, Ogunji describes the thoughts racing through her mind at the time, “in that beginning moment i doubted so much. i had to remember the words i had spoken upstairs. trust, rest, trust. i learned so much in the first five minutes. walking required my entire body (were we actually even walking? it felt like something else).” However, this isn’t the first time Ogunji has performed this act- in 2011 she crawled along the ground “with water kegs tied to [her ankles] inspired by the daily task of carrying water at [her] cousin’s house.” In collaboration with the Center for Contemporary Art Lagos (CCA), in Will I still carry water when I am a dead woman? 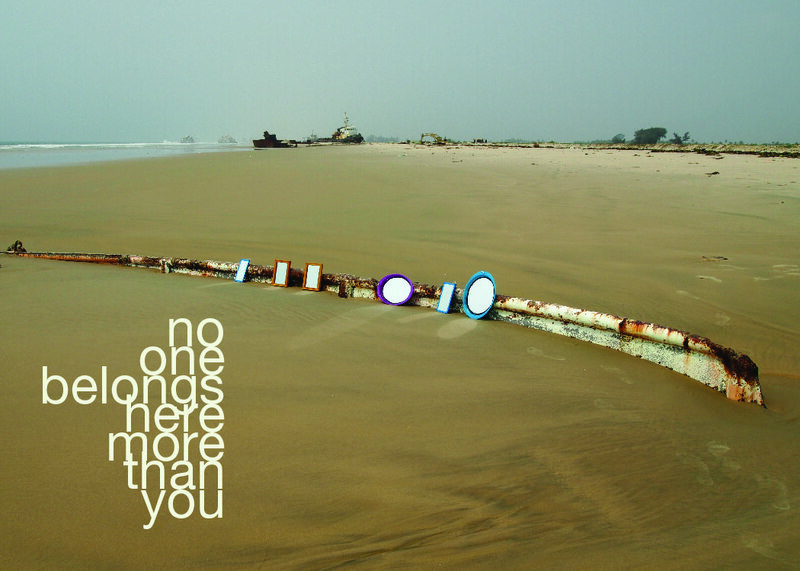 Ogunji creates a spectacle out of the mundane by illuminating certain notions of women and space in Lagos. In their performance, Ogunji and the other women are dressed in matching costumes (with an “Afrofuturistic touch”) for more than just aesthetic appeal, rather Ogunji attempts to conjure images of the Egungun Masquerade, which women are not typically allowed to perform. In tradition during the Egungun masquerade the masked dancer is allowed to travel anywhere and they are protected (People are not even allowed to touch them); as such, Ogunji builds on the daily task of carrying water, by simultaneously “allowing women to occupy a sacred, dynamic, and public space” through their performance as masked water carriers. In her quest to evoke dynamics between labour and women, Will I still carry water when I am a dead woman? is one mere example of how Ogunji’s work excavates the complexities of the relationship between women, society, space and politics. 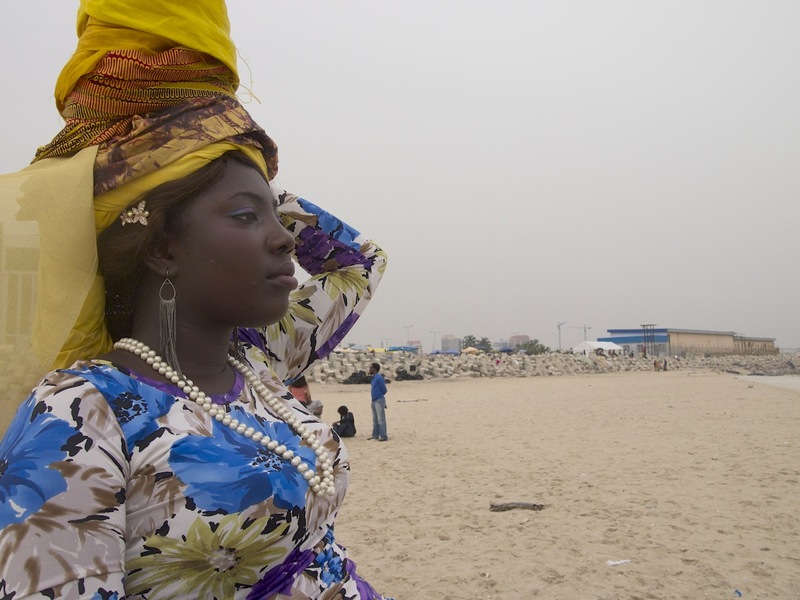 Based in Austin and Lagos, Wura-Natasha Ogunji is “best know for her videos, in which she uses her own body to explore movement and mark-making across water, land and air.” She has received a number of awards for her working including a John Simon Guggeinheim Memorial Foundation Fellowship (2012). If we think of performance art as art that “does” in the immediate, specifically in the space that it occurs, yet also has the capacity to travel in impact and medium as a consequence- then Ogunji’s pieces aim to “do” in Lagos. We asked her a few questions about her recent work- her experiences carrying out these ambitious performances, the audience engagement and what she has coming up in the near future. OKA: Performance art often involves creating a spectacle. Do you ever worry that people are more focused on the spectacle rather than the messages you’re trying to convey? 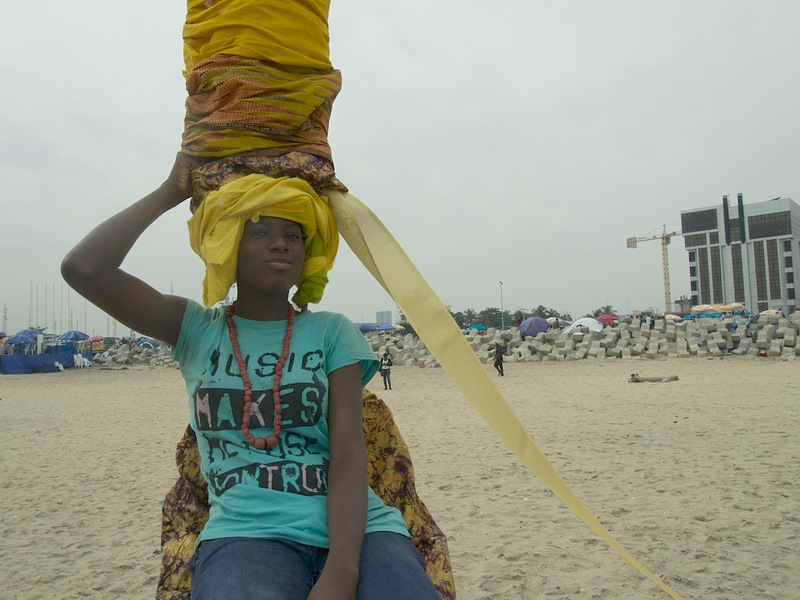 Wura-Natasha Ogunji: I’m interested in creating a particular exchange between the performers and the audience. This requires a kind of respect and consideration for the public which I don’t at all associate with spectacles. When I think about a spectacle it brings to mind a particular image or event that is intended to shock. And things that shock us don’t necessarily create opportunities for conversations or transformation. I love this question you are asking because it really gets at the challenge of creating meaningful performance. As an artist I am creating certain parameters and asking certain questions but I don’t determine the answers and I certainly don’t own the experience. The collective is incredibly important to this process–be they audience members or performers or students trying performance for the first time or a bystander who participates. I expect the audience to do some work, to ask questions, to figure some things out on their own. People sometimes ask, what is this about? And my first answer is always, what do you think it’s about? What did you see, feel and experience? I have found people in Lagos to be very generous. They ask questions. They respect the performance and the performers. They give a lot. But they also require a lot because you can see crazy things here on a daily basis, in any moment. I am very interested in interruptions and disorientation. The fact that we are women occupying public space in unexpected ways is an immediate interruption. I want people to stop to look because they are seeing something that calls their attention in a particular way–and not in a violent way. A fight can stop traffic. I want to interrupt someone’s daily journey with something different. I want people to stop, to witness, to comment on the work or ask questions because they feel drawn to it, pulled by it in a way that expands the imagination. OKA: You mention that a lot of your work is done through your body as a way of understanding larger questions of how bodies engage with space. Are you also addressing more abstract notions of space (diaspora) particularly as someone who lives in the U.S. and Nigeria? WNO: Yes, absolutely. My previous video and performance work definitely considered larger spaces of the diaspora. I was particularly interested in the Atlantic as a site for memory, history, creativity. The videos I made including ‘The epic crossing of an Ife head’ provided a way for me to explore this space between Africa and the Americas. I began that series because I had a question about this relationship. I asked “Does homeland long for us?” In answering that question I thought about the physical efforts that the Ife head would have to go through to find her descendents in the Americas. In order to cross the Atlantic she must either fly or walk on water. Taking on that persona of the Ife head I attempt to fly by jumping into the air. I saw the physicality of that act as akin to the efforts required to make that connection across space which is really across that enormous ocean. The journey is also about moving through one’s history–both personal and collective. Now that I am in Lagos my questions have, of course, changed. I can say that homeland indeed longs for us which I understand to mean that there’s a place for me here in this present moment. And now my engagement with the body (both my own and others) is affected by this particular urban space in which I find myself. OKA: What has the response been to your recent pieces, beauty and Will I still carry water when I am a dead woman? WNO: People always have a lot of questions. With beauty the five of us had our hair braided together and we stayed that way for four hours. There were people who said we wouldn’t make it, that we wouldn’t last the four hours. There was someone in the audience who talked about how this piece was for Nigerians. I understood that to mean that the person not only felt a connection to the work but that they thought it had relevance to this place and people specifically. My favorite response was a conversation with a young girl, perhaps she was 9 years old. She asked why we had done the performance and then I spoke with her about the connections we have as women to our hair and the even more important connections we have to each other. She understood that of course, she feels it too. Will I still carry water when I am a dead woman? was different. We were masked during the piece. I heard a lot of comments about our strength. A friend told me that someone asked why we would be carrying water kegs through the streets if we were not getting paid. There was also a woman who thought we were being punished and that the punishment was too harsh. One of the performers, Wana Udobang wrote abouthow the piece brought into focus the ways in which we, as women, place burdens on ourselves and that in the end no one else even acknowledges our work, they stop even noticing our struggles. She observed that by the end of the walk through town people began to almost ignore us as they went back to their daily lives. OKA: Did you notice anything that your audience was doing while watching the performances that you found particularly interesting or even strange? WNO: beauty was an incredible experience because we were in the middle of Obalende Motor Park. Hundreds of people passed by during the four hours that we were performing. They were watching us and we were watching them as intently. As performers we all spoke about that experience. We talked about even wanting to film the audience watching us. It’s an incredible feeling, to be witnessed in this particular way by strangers and to also be in a position to really take in another person’s presence, someone you don’t even know. OKA: What projects do you have coming up in the future? 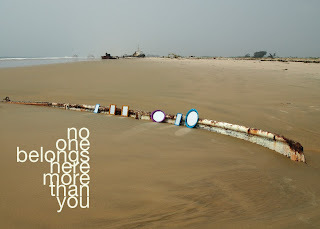 WNO: I’m in an exhibition with two other artists (Ruby Onyinyechi Amanze and Nnenna Okore) called ‘No one belongs here more than you‘ which opens at the Centre for Contemporary Art, Lagos this June. I will show a new video installation as well as documentation of the performance works. I’m also creating a performance for the opening that draws from the tradition of bowing and prostration. We are facing the sea. It is a cloudy day at Bar Beach and we are sitting on raised platforms looking out over the Atlantic. This place is fast becoming Eko Atlantic, a planned extension of the city constructed on reclaimed land; developers describe it as 'the new financial epicentre of West Africa.' It feels like a science fiction novel--creating land from sea. A god-like arrogance fuels the project. Humans are drawn to epic feats and Lagos is a city of extremes and exaggeration, so why not here? City workers tend the sand. Police officers sit waiting. They will yell at anyone who attempts to walk onto the beach, especially lovers who dare to take photographs by the shore. This place is only open for public holidays and barely even that. Such a feat does not happen in a vacuum of course. In August of 2012 an ocean surge pulled 16 people to their deaths and flooded parts of the island. 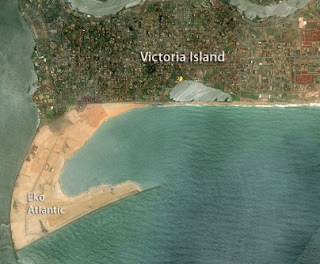 Scientists and critics attributed the sea swell directly to the project. 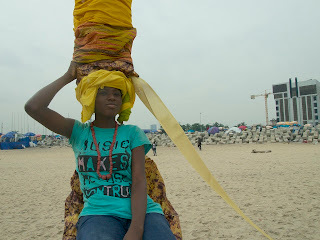 And earlier this year a teacher tells me of how her student is now homeless because of the Eko Atlantic. Bulldozers came to remove the shacks on the beach and now many people are without shelter. The arrogance of politicians and businessmen. I have never understood this, the math of people's lives, that you can exchange one thing for another as if they are equal, as if Eko Atlantic is greater than or equal to the dignity of humans, is greater than or equal to homes, is greater than or equal to the efforts of a father who lives on the beach with his family and works hard to send his child to the French school because he knows it will make her life better than his own. Greater than or equal to. Humans are so terribly arrogant. Or perhaps it is pure lack of imagination that prevents the developers from taking care of the people affected by the project. And then there is us, Queens, a group of four artists making performance under a cloudy sky. It began with a story. I asked artist Ruby Amanze to write a score or directions or impressions about Nigeria that would become a public performance piece. (See Palestinian artist Emily Jacir and American artist Clifford Owens). Ruby writes: I think about worship. What it means to worship something or someone. I think about worshiping oneself. Being god-like somehow. I see a throne. Women can’t sit on those here. But what if? And a crown. Something about wrapping your hair with one of those traditional, elaborate, crunchy fabric headwraps. But the fabric is super long. Awkwardly long and maybe heavy. And the wrapping takes forever and makes your arms tired. And then your head gets a little wobbly as a result of the weight. But it’s still a crown. For the performance we sit on raised platforms wearing sky-high crowns. We are queens for a day, attached to each other by a length of aso oke. The crowns are awkard, they wobble on our heads. They are at once regal and not. Ruby and I begin the piece. After about an hour we trade places with two other performers, students from Yaba Tech who are now fully committed to the practice of performance, Mary and Taiwo. We fit the crowns to their heads and step down onto the beach. My friend Connor walks up and asks for the name of the gele knot near the top of the crown. My sister, Folashade has tied it. She replies, Afojusoko, face the husband. He laughs, let's call it Afojusokun, face the sea. I love my people. I ask Ruby what the experience was like for her. “Facing the sea I was thinking, this is all mine.” I was thinking the same thing. But we are thinking so much more. This is all mine. I am thinking about history and conquest, the slave trade, colonization, land, property. But more importantly I am thinking, “This is all mine, meaning what I see and what I imagine is all mine. I can make it whatever I want it to be.” And in this pause from the chaos of Lagos, we are here staring out at the sea and while we wear these crowns whatever we imagine is ours. Other women wear the crowns throughout the afternoon. One of the beach police officers is extremely excited when I ask her if she would like to participate. And later a stranger sits confidently with the wrapped fabric atop her head. She is quiet and smiling. Near the end of the performance Ruby and I once again wear the crowns. We decide to stand up during the final moments. There is commotion on the beach. My sister tells me that there is an oga that is higher than the police officers we bribed. He works for Lagos State and wants us to stop performing immediately. From the raised platforms Ruby and I stare at each other. The small arguing crowd comes closer. We hear the oga say, “I don't want you to get the impression that I'm a bad man.” One of the police officers says it's time to come down. I look at the non-existent watch on my wrist. Ruby and I are still staring at each other and now we are laughing. I'm wondering if we will be physically pulled off of the platforms. It's about 5:35pm now. I actually thought we might get kicked out much sooner. We continue laughing while also maintaining our composure. We are queens after all. Someone in the crowd says, “They're praying.” This brings the arguing to a halt for a moment and buys us time. “Oh, they're praying, well, let them finish praying and then they can come down.” More laughter from the queens. A friend see the photographs from the performance. She couldn't be there but is so excited about the piece. She tells me, “You know women go through so much in this society, but I love how when a woman puts on that crown, in that moment she feels untouchable.” That's exactly what it feels like to face the sea while wearing a crown that is connected to another woman wearing a crown and facing the sea. Untouchable.